Obsolete: Book review: Flat Earth News by Nick Davies. 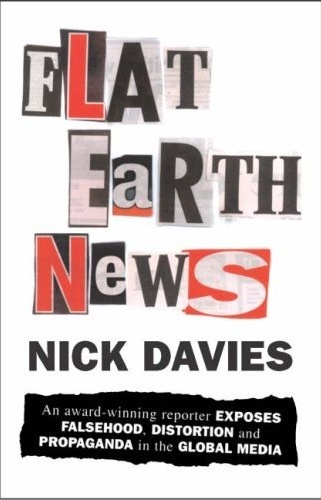 Book review: Flat Earth News by Nick Davies. As Nick Davies writes in the prologue of Flat Earth News, he left university in 1974, the year that two men, armed only with notebooks, pens and although Davies doesn't mention it, an impeccable source, brought down the American president by exposing his corruption. The very idea of such journalism is therefore an incredibly noble one. The fact that, according to Davies, journalism has become corrupted to its very core is one that ought to make us just for a second sit up and take something approaching notice. If we judge Davies' book by whose resignations it brought about, or at the very least contributed to, then similarly it deserves much of the praise that it has already received, almost completely in the broadsheet press (The Daily Mail, which has its own chapter in the book, has mentioned it all of twice). Although it has been firmly denied by both men, it's rumoured that Davies' chapter on the Observer, where he exposes the behaviour of Roger Alton, a sub-editor without much of a clue on politics promoted to editor on one of the liberal-left's flag bearers, and Kamal Ahmed, chosen by Alton to be the paper's political editor despite having no contacts within Westminster and uncertain of its very traditions, with its tale of how both came to rely on Downing Street and Alastair Campbell, culminating in the paper's support for the Iraq war, led to both leaving the paper late last year. More conspiracy-theory minded hacks have postulated that the Guardian editor, Alan Rusbridger, directly commissioned Davies' attack due to a spat between him and Alton, and it's true that Rusbridger gave his full support while Davies took a break from his freelance investigations for the Graun to write FEN. Whatever the truth of the matter, the chapter on the Observer is actually one of the weakest in the book, but that's only because much of the rest of the content is little short of dynamite. Beginning with the tale of the millennium bug, probably the biggest indictment of our press until they comprehensively failed to challenge the WMD myth, the narrative that Davies weaves is one of a trade that has either reached its nadir, or will very shortly, unless urgent action is taken. For once, it's a call to arms that deserves to be answered. Unlike how some critics have attempted to paint Davies' argument, he in fact makes clear that he doesn't believe there was some golden age in journalism, nor does he blame giant corporations out to make money for making their journalists tell lies. One of his first dismissals is of the two main schools of criticism on the press; that the firms that advertise in its pages have undue influence on the editorial line, for which he can find no evidence, and that the proprietors themselves routinely interfere with the papers they own. While he acknowledges Rupert Murdoch's tight-grip on his newspapers, he provides examples of how he uses politicians for his own ends, then dumps them when they have served their purpose. Hence having been the biggest believer in Thatcherism you could imagine, he nonetheless abandoned Major and turned to Blair's New Labour when he realised his interests would be served better by Blair and when Blair in return made clear he would not threaten his business interests. For all his views on freedom, Murdoch notoriously removed the BBC from his Star satellite service in China when the cadres complained. Murdoch is most of all a shameless opportunist and a megalomaniac; anything that gives him yet more control and more money is worthy of support. This, rather than real allegiance to either the Bush administration or Blair is what informed Murdoch's support of the Iraq war: he wanted the $20 barrel of oil at the end of it that would have so cut costs for his empire. Instead, Davies' main thesis is that the "grocers", the new owners that bought the press from its family owners have imposed their business logic on a sector that cannot simply cope or it do its job properly under such conditions. Davies commissioned research by Cardiff University that chose two random weeks and analysed every single domestic news story put out by the Times, Guardian, Independent, Telegraph and Mail and then tried to identify what the sources for the reports were. Their findings were stark. 60% of the stories they analysed were consisted either wholly or mainly of wire copy and/or PR material; 20% contained clear elements of wire copy and/or PR to which more or less other material had been added; 8% of the stories they were unsure of its source, leaving only 12% of stories which were entirely made up of material generated by the reporters themselves. Of the papers, the Times was the worst, with 69% of its stories consisting wholly or mainly of wire or PR material, with the Guardian best, with just over half of its stories containing the same material. Those at the real sharp end are those working on the local papers, who are so strained for their time that they hardly manage to leave the office, which is vital for building up sources and actually reporting anything accurately. A diary of one reporter's week is included which makes for shocking reading. As Davies points out, there wouldn't be much of a problem with this if either the wire services which journalists rely on are accurate, or the PR industry was honest. Instead, the latter is a charlatan, while the former is under the very same constraints that the journalists themselves are. Where formerly there were numerous local agencies around the country which provided copy and local nous for both the local and national press, these have been stripped, thanks to the business logic of the grocers, to the very bare bones. Although the Press Association, the main UK wire service, refused to confirm Davies' figures collected from the staff themselves, vast areas such as Greater Manchester, Lancaster and Cumbria are now covered by just five reporters. Similar numbers cover other wide areas of the country, while the whole of Scotland for example has but fifteen reporters. They're not even all working at the same time, as they cover shifts. It's not just the rural areas that are suffering - the Houses of Parliament, 410 local councils, the whole national network of courts, police services and authorities and much much more (see page 76) is covered by just 69 reporters. He highlights the case of the "BNP bombers" that was only noted in the "blogosphere", almost certainly because of the lack of reporters that would have previously have covered it. The BBC has been subject to the same forces - and the demands placed on the reporters to get the story out are so onerous that it expects them to be able to write a suitable summary of the subject, check its sources and provide it for both the website and Ceefax within five minutes of it breaking. What happens is that accuracy and authority goes out the window. Davies provides examples from across the Atlantic to outline that this isn't just happening here, but globally. These conditions have established "rules of production", unwritten values that now inhibit journalism's natural duty to provide the truth, and which are designed to help the grocers through cutting costs. The first is running cheap stories, which means abandoning the special investigations which take a lot of time, effort and money. The provided example is of AP discovering the details of a massacre during the Korean war by US troops, which AP was determined not to run because of the potential downfalls of such a story in terms of backlash. It was eventually ran, 16 months after it was first submitted, completely re-written and toned down, and it still won a Pulitzer, but the reporter responsible resigned after being sidelined despite his success. The second is to select safe facts, which are perhaps best described as Rumsfeld's known knowns, the things we know that we know, or at least think we know. Hence, the millennium bug is going to cause chaos. Iraq has WMD. Heroin is deadly. The MMR jab causes autism. Immigration is a bad thing. Skipping some, rule eight is give them what they want to believe in, which affects both tabloids and broadsheets alike. Nine is to go with the moral panic, which coming from this blog you don't need to be informed further of. Rule ten is ninja turtle syndrome, which is to publish stories regardless of whether they're merited, purely because elsewhere has covered them, like the Talibrum at the start of this week. Davies next turns his fire on the PR firms directly, then on the secret state actors that have so infiltrated the news post 9/11 and provided so many stories which are either completely uncheckable or that are justified purely on the basis that a "security" source has provided them, regardless of their own personal motives. Davies' main case study is about Abu Musab al-Zarqawi and how he became the most evil man in the world, dying multiple times, losing limbs and appearing in numerous places, linked to dozens of attacks, all of which were completely untrue or not backed up by the evidence subsequently unearthed. That he eventually did join up with bin Laden, despite previously wanting to run his own rival terror network was almost a self-fulfilling prophecy after the press had so often described him as a top al-Qaida terrorist. The final part is Davies turning on the British press itself in detail, first exposing the "dark arts", where newspapers routinely break the law despite being the most vociferous on those outside Fleet Street, whether in the public or in parliament who do so. Steve Whittamore and the Information Commissioner's discovery of his meticulous records of the newspapers that had used his services to discover details about private individuals via his sources in the police and elsewhere is explored in detail, with a reporter formerly at the Mail boasting about how they bribed not just the police, but contacts in the civil service, giving them free access to all of their targets' personal details. The Times and Sunday Times are also heavy users of such arts, before Davies recounts the mostly amusing story of 'Benji the Binman', who discovered the papers that proved the Guardian's case against Jonathan Aitken, sifting through what had been dumped out by his solicitors. The Guardian's David Hencke helped him make contact with a freelance journalist who sold his findings with more aplomb than Benji himself had managed. Less amusing are Davies' revelations about someone called "Z" whose leaking of criminal investigations has tipped those targeted in them off, the celebrities threatened with violence and the bug discovered in a BT junction box near the home of Angus Deayton. Davies ends by suggesting that Whittamore's team is back working again, just without using the police national computer, which led to their prosecution being accessed this time. The next chapters deal with the dizzy heights of the Sunday Times's Insight team, from the highs of exposing the Thalidomide scandal and discovering that Kim Philby had been head of the anti-Soviet section of MI6, through to the lows of the sale to Murdoch and alleging that Michael Foot was KGB agent, all instructive of how profit pressures and cutting desperately affects a newspaper; the aforementioned expose on the Observer; and finally the hatchet jobs, racism and general viciousness of both the Daily Mail in print and within its offices. These chapters probably don't tell you anything you don't already know, especially if you're an avid reader of Private Eye or general watcher of media scandals, but are a good collection of just how vile and corrupt distinguished newspapers, not just the red-tops, can be. As you would expect, there are problems with Davies' main thrust. As convincing as his points about the "grocers" are, it doesn't explain how or why, despite their business logic, that all four main broadsheet newspapers in this country currently lose money, from £50m in the case of the Guardian/Observer, up to £80m in the case of the Times. One of the few wounding parts of Paul Dacre's Cudlipp lecture from last year was that the "quality" press can't make a profit, and is subsided by the other parts of the companies that do. Hence the Guardian, although its website turns a profit, is subsidised by Auto Trader, while the Times is bailed out by other parts of the Murdoch empire which make silly amounts of money, including the Sun. That has always been Murdoch's trump card whenever anyone criticises him and his offerings in the UK; he could have closed the Times down, but instead keeps it going and losing him money for the 600,000 plus readers it has. That the paper offers him the prestige of owning one of the world's oldest, most famous and respected newspapers is never mentioned. Perhaps, seeing as we buy almost more "tabloid" newspapers than anywhere on the planet, we actually have the press we deserve. Peter Preston, in his review of FEN, also says that the numbers of staff on the broadsheets has actually gone up rather than down, contrary to Davies' claims. He also overplays his card on the local press, who are and always have been distinct from the Fleet Street papers, despite them greatly helping them with first breaking stories they then follow up. In the digital age, it's almost certain that such newspapers are going to go fully online before very long, cutting their costs further, and after all, why do small towns or even some of the larger cities really need a daily newspaper anyway? Of course, whether the "grocers" then put more money back into cultivating young journalistic talent is the key question, when all the signs point towards them just lining their and their shareholders' pockets still further. Simon Jenkins is also right when he points out that the press, despite Davies considering it almost intrinsically corrupt and the journalists increasingly starved for time to check their facts or run investigations, still manages to expose the corruption of BAE Systems and the cash for honours scandal, although he's less convincing for his praise for the Mail in exposing Stephen Lawrence's killers. Many consider that to have been the final nail in the coffin of any chance of convicting them of the crime. None of this however destroys Davies' main conclusion that the press in this country, and this is a press which is largely regarded as being one of the most ferocious and independent in the world, is if not completely compromised, coming close to being on life support. The press has never been a beacon of truth, but it's becoming dangerously close to offering the exact opposite: the downright lies and prejudices of the security services, the commercial interests of the corporate conglomerates and the PR industry, and the casual reiteration and assumption of facts which are not facts until they are checked, checked and then rechecked again are all directly offending against the media's first priority. Churnalism and Flat Earth News are not just a threat to our own knowledge and understanding of the world around us, they are a threat to democracy itself. The really sad thing is that I can't even see much hope in Davies' conclusion that the internet at least offers something approaching an alternative voice: it too, despite all the contempt for the "dead tree press" or the "MSM" routinely voiced, directly relies upon on it in order to survive. The BBC too is increasingly threatened, not just by the potential top-slicing of the licence fee or the end of it, but by the commercial pressures that affect everyone else and make director generals fund BBC3 rather than news and current affairs. When it comes down to a choice between Lily Allen and Friends and Dawn Goes Lesbian over Rough Justice and Newsnight, I'm increasingly pessimistic over which the public themselves really wants, and one of Davies' own rules of production is "give them what they want". "They" are always right, and everyone else is always wrong. Thanks a bunch for that - a perceptive and thought provoking review. FWIW it has finally prompted me to promote your blog to my 'Must Read' NR folder - one of only 10 - which is praise indeed; if only from an ageing nonentity that has all but given up on the Orwellian corruption of governance and public life in this country, coalesced as it is around the epoch defining 'through the looking glass' stupidity of the so-called 'Washington Consensus'. So what does he say about the Guardian, then - the one which, in my estimation as a lifelong reader since the 1940s, has suffered the worst fall from decent journalistic standards of all under its present regime? Not that much - probably because it came out the best of a bad lot in the research that was commissioned for the book, although the website takes something of a hammering for regurgitating wire copy verbatim. Davies does of course freelance for the Graun - but then the most hostile criticism in the book towards a "quality" paper is towards the Observer, also owned by the Graun. It is hinted in this review that Rusbridger 'commissioned' Davies to write FEN. Such hints or speculations appear in a few other reviews. But what is the evidence for this claim ? For example, in FEN itself Davies is at pains to acknowledge those he can, and to excuse his lack of acknowledgment to those to whom he can't extend his thanks (for obvious reasons). Why would something as significant as identifying a commissioning by a Fleet Street editor be omitted ? For what it is worth, I don't believe that it was commissioned, and I don't think that FEN has got anything to do with inter-Fleet Street rivalry or Guardian/Observer internecine warfare. Um, I wrote that "More conspiracy-theory minded hacks" have postulated that Rusbridger commissioned it. I didn't suggest that he did and I think it's unlikely; he did however OK it with Rusbridger, and I think it's almost certain that the chapter on the Observer helped in the downfall of both Alton and Ahmed. Thanks for this awesome review - it's given me a lot of food for thought and I'll definitely be hunting down this book now. If you’re interested in conspiracy theories well have I got the book for you. “Conspirator’s Odyssey” by Aaron Kinte Kuykendall is a wild yarn that tries to pretty much link the supposed UFO landing in Roswell to JFK’s assassination, while throwing a whole lot more in there for good measure. It’s a little like the Celestine Prophecy in that it’s a fictional book about possible non-fiction events. If you love a good juicy conspiracy and let’s face it, who doesn’t, then you’ll no doubt love reading through this funny and sometimes thought-provoking tale. Just what are they hiding from us – and while we’re at it, who are they anyway…? Great stuff, thought you might be interested. A victory for freedom of thought? Nepotism? On a newspaper blog? Flat Earth News and the Talibrum.